Just discovered this tool only now. Tried seeing if I can update values in the weapondata.xml myself but wow. Don't even know where to start. I just want stats about the M416, AEK and Ace-23 with Hbar, Comp. Stubby, Ergo attachments. I surely don't know enough to figure out why it's not updating the weapon data. 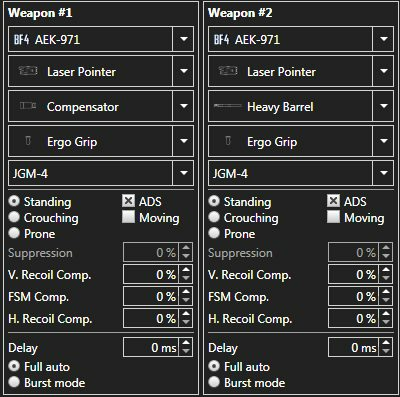 I manually edited the weapondata.xml and put in the updated data for the M416, ACE-23 and AEK and all their attachments. I put in the data for these weapons as it's the weapons we use most often here in South Africa for competitive Battlefield. With time I'll attempt to put in more weapon data. I attached the xml for anyone that wants to use it. Thank you very much, b1scu17. I would gladly assist you in updating the data but I have absolutely no idea how it works. Besides, I think it would be less time consuming to figure out why the software does not update the data when you click the "Update from symthic.com" button. Edit: Alright, I figured out how to edit the data... But damn, it is a lot of work, even the values for the attachments need to be updated. Edit: I updated the data for the assault rifles. If more people are interested, I will add assault rifles from the DLCs. On a side note: I hate you Symthic people for not fixing the issue and thus making me do this. Edit: The assault class is now complete. I am not sure whether I will update the other classes, it is pretty time consuming. Please tell me the last link,thank you very much! I think nobody develops this atm and the mechanics can be very outdated. Nevertheless I'll let this topic to stay open in case somebody has a link to share. 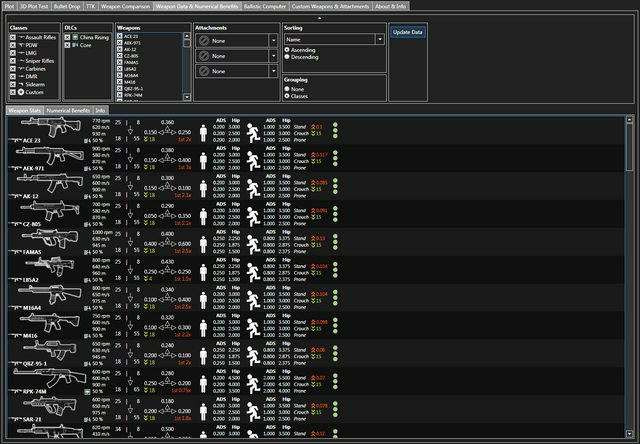 RE: Symplot - v.1.0.0.0 - new WIP (05.02.14)! this linck of the file has been removed,could you update it? I'm currently working on an improved version of Plotic for BF4, written in C#. Set of various parameters such as weapon with attachments, stance, recoil compensation, scope and fire mode (full auto or burst). The "compare weapons" option enables side-by-side comparison of these 2 slots. Allowing more precise comparison of the Plots of the 2 weapon slots. Available via the context menu of the plots. 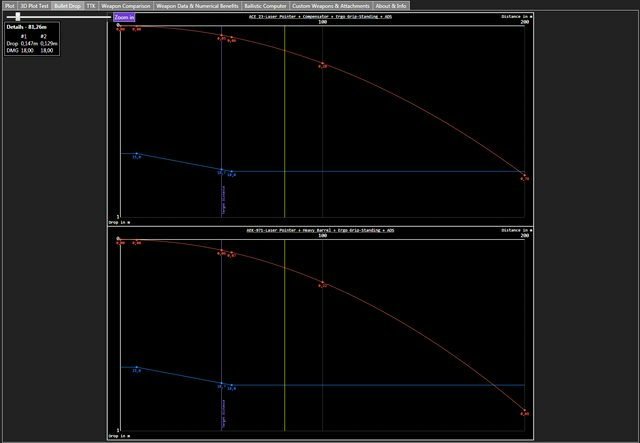 Shows bullet drop and damage as a function of the distance. Shows time to kill (TTK) and bullets to kill (BTK) as a function of the distance. Opens symthics comparison of the 2 weapon slots or the info pages of the weapons. Displays the stats of all weapons in a handy grid. 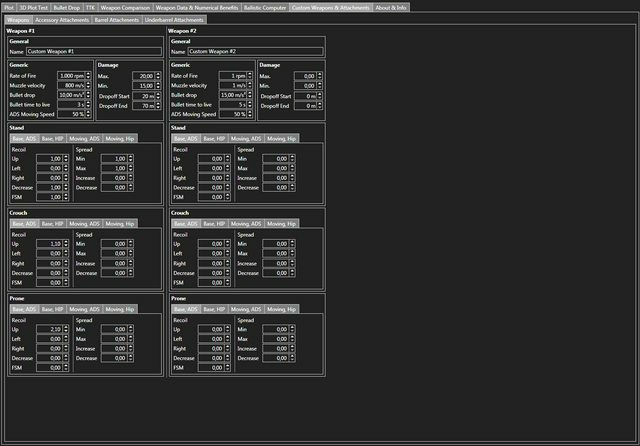 Supports different filters (classes, weapon, DLC), sorting, grouping by classes and attachments. 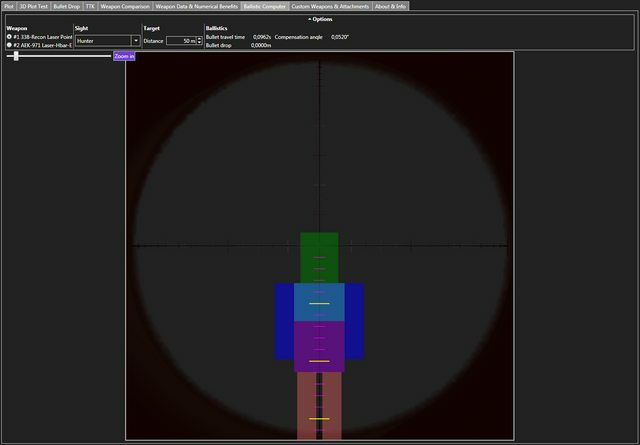 Allows you to visualize the bullet drop and target size for all scopes and distances with one of the weapon slots. 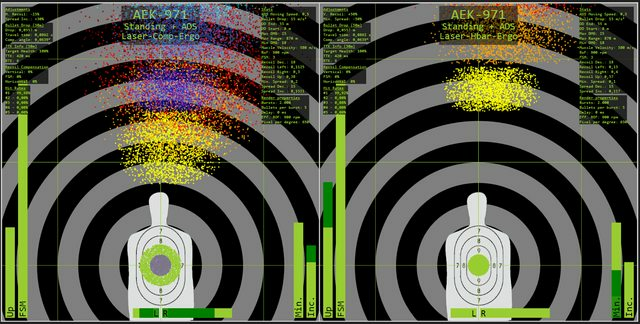 Placeholder system allowing dynamic naming of plots, charts, etc. 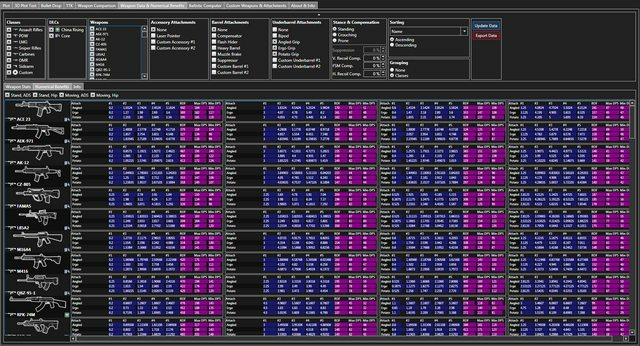 This is still work in progress, so Heatmaps are still missing and there might still be bugs/glitches present. Some weapon/attachment stats might be incorrect so if you note a mistake, please report it to me. The latest WIP (work in progress) file is updated on an irregular basis and is basically a copy of my current progress with the next update of Symplot. This way you don't have to wait for the 'regular' update to try out new features and you can already give me feedback. This comes with a certain price though, the file is not 'polished' and may still contain bugs/glitches. Fixed an error that messed the weapon data up when it was updated from symthic. Only affected users with a OS culture that uses the point as decimal limiter. Symplot now uses the OS culture instead of en-US. Improved Plots & Charts: Now supports zooming with mouse wheel, zooming in with double clicking and dragging. If you didn't specified a default folder for saving, you'll be asked to do so upon initiating an operation (Autosave, Multiplot) requiring it. Added Details Pop Up to TTK/Bullet Drop chart. Move your cursor on the chart to see the exact values at the selected point. Added Recoil Preview (right click on Plot for weapon #1), it's more of a gimmick, as recoil decrease mechanics are still somewhat unkown. 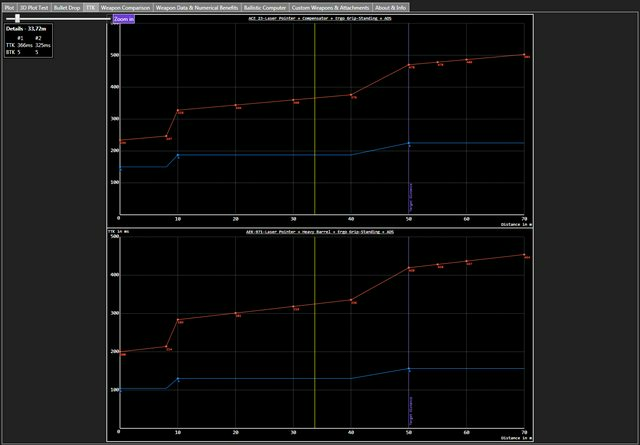 Added compare feature: displays 2 user chosen plots side by side, can be saved too (small text is hard to read for some reason). Slightly adjusted the program design (removed some unnecessary borders). Sadly, as I said above, it seems like nobody is working on this piece of software and it has not been updated in ages. I am going to lock this topic to avoid unnecessary necros from people asking to update the post. However if you have the newest version on your machine or so, please contact me and I will update this post with up-to-date link.